Purdue's New U, the online institution formed from the university's acquisition of Kaplan University, is now going to be called "Purdue University Global." The formal name will go into effect in late February, when the Higher Learning Commission (HLC), the regional accreditor for Purdue University, is expected to approve the Kaplan purchase. That process began last April, when the Indiana institution announced it was acquiring the for-profit online entity to extend its reach to non-traditional students. HLC isn't the only official body to weigh in on the deal. The Indiana Commission for Higher Education approved the purchase in August; the U.S. Department of Education also approved the acquisition, as long as the new name included the word "Purdue." Purdue officials said they tested out the new name with faculty, staff, students, alumni and other stakeholders at both schools. 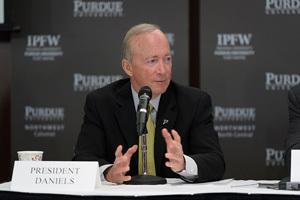 The challenge, said Purdue President Mitch Daniels in a press release, is that typically Purdue's campuses are named after the physical locations where classes are held. In the case of the new institution, "Purdue University Global can be accessed from anywhere in the world, at any time." Yet the new name "proved appealing and meaningful to our various stakeholders — most importantly prospective students." Kaplan's Concord Law School and Open College will become Concord Law School at Purdue University Global and Open College at Purdue University Global. Also, the home campus for Kaplan is currently in Iowa. For the new institution, the home campus will be in Indianapolis. Betty Vandenbosch, president of Kaplan University, will become chancellor of Purdue U Global, which will operate almost entirely online. The transfer is expected to be completed during the second quarter of 2018.